I could use the bathroom." We are endlessly lucky to have terrific authors writing short stories for up-and-coming readers. In Sergio Ruzzier's hands, with his unique and most enjoyable art as the backdrop, we are doubly blessed. 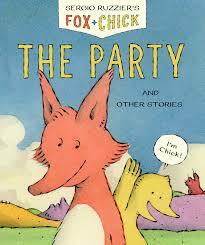 He uses great variety in presentation and lovable characters to tell three stories starring Chick and Fox. New readers will appreciate the opportunity to learn more about the stars of the show in detailed and humorous images, filled with bubble speech dialogue. Chick is full of life and enthusiasm; Fox is not. Fox takes life as it comes in an easy, accepting manner that is foreign to his pal. Nevertheless, they are great friends; Chick lively, Fox indulgent. They share three stories: The Party, The Soup, and finally, Sit Still. One involves a misunderstanding - or is it? The next concerns Fox's diet - what it should be, what it isn't, and what it might someday be. The last is about patience and understanding - at least, from Fox's point of view. He is ever tolerant. He is the friend we all aspire to be, and to have. It feels like a graphic novel, and early readers will love that. Sergio Ruzzier's signature artwork is sure to please his fans, new and old. 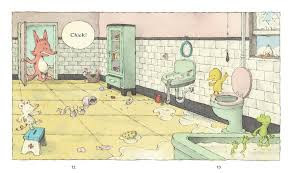 Filled with color, charming characters and backgrounds sporting eye-catching details, they will pore over the panels and delight in the subtle humor. Do not miss the final page! It provides hope for meeting Fox and Chick again.